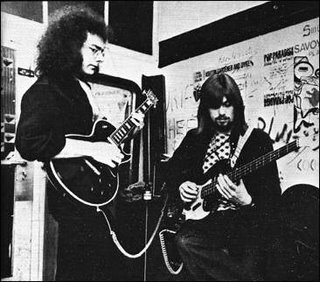 Islands is the fourth album from King Crimson, released in December 1971, and Islands is its final track. The last plaintive note from Marc Charig’s cornet leaves the mellotron drifting solo into silence. Late, eyes closed and dreams close (for that is when this is played). Too comforted, too comfortable to raise yourself to raise the needle. The silence plays on and is interrupted by one of those very popular (with record producers not listeners) “hidden tracks” – in this case “studio sounds” – then back to silence – briefly – until the soft thud of the needle at the end of the line enters its relentless cycle. But neither mind nor body could manage that effort. And no-one does. So, on and on and on … endless repetition of the amplified “needle-at-track’s end” sound. Many senior high school nights ended by drifting off to Islands. 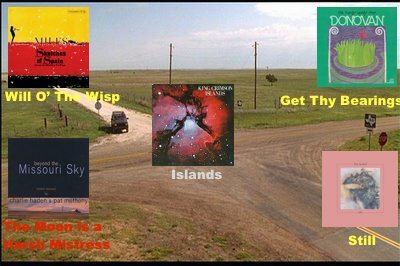 But it’s only in the final, title track, all 9:14 of “Islands,” that King Crimson get to the best of their music and the heart of their dilemma. It’s a pastoral, lyrical, open-ended and open-tuned piece that washes over you like slow tides or an extra-warm bath late in the evening, and just like that bath it has a tendency to put you to sleep in the tenderest, most sanguine way. In fact, I recommend it for that very purpose, with no sarcasm intended. Islands wins the Award of the Month, and perhaps of the Year, for Best Last Record To Put On Before Retiring. What are the links between Islands and The Moon Is A Harsh Mistress? Dam! Apart from the impact on me – peaceful, emotive, numinous – I can’t find a connection. Well I guess that is connection enough, isn’t it? Scale, space, and solitude are also shared traits. Both are evocative, silhouetting the infinitesimal against the infinite, the fleeting against the eternal, being against nothingness, self against the other. They echo for me the beautiful opening of William Blake’s Auguries of Innocence – where paradoxes illuminate time and space. No? The connection that is a disconnection? Then perhaps perhaps the link comes from the lyricists – Jimmy Webb (The Moon Is A Harsh Mistress) and Peter Sinfield (Islands) – both have written some extraordinarily nonsensical lyrics, most famously Webb’s Macarthur Park. * Islands cover by Jakko Jakszyk, Mel Collins, Danny Thompson, & Ian Wallace. West: That way goes to The Moon Is A Harsh Mistress. I reckon ‘mood’ is a reasonable (if subjective) connection. Agreed and pretty much what I meant by “impact on me”. I did try to exclude that as a connector but there is no doubt some connective tissue there. I really thought there was a link between Charlie Haden and some members of KC – I had in my mind that Charlie Haden and Marc Charig both contributed to Carla Bley’s Escalator Over The Hill. I must try and get hold of Moondawn – I haven’t heard much of his work at all. I am glad you enjoyed this little journey. I haven’t done much – anything really – for a bit. Basically, more substantive employment has had precedence over time and energy. However, recently I had just started doing a little research on my next crossroad – and your feedback may just be the spark I need to start again. Thanks. You are welcome. It’s a fine idea and I’d welcome further instalments.